Flooding from the Platte River has impacted the city of Lincoln's wells. The city has issued a mandatory water reduction, and campus leaders announced measures to conserve water. Due to the flooding along the Platte River and the stress this has placed on the water supply for the city of Lincoln, the city has issued a Level Two mandatory water restriction. The University of Nebraska-Lincoln announced water-reduction measures in a campuswide email March 18. "As one of the largest water users in the city, we had already begun taking cooperative steps to reduce water usage following conversations with city leaders over the weekend and are implementing additional actions today," Chancellor Ronnie Green said. "We would ask everyone in our university community to take whatever personal steps you can to help conserve water during this challenging time." The university's water usage is greatly decreased this week because of Spring Break, with approximately 400 students in University Housing facilities instead of 6,000. This includes students utilizing housing at Selleck Quadrangle because they were unable to return home due to the floods across Nebraska. Cather Dining Hall is the only dining hall open this week and will be using disposable tableware to minimize washing. 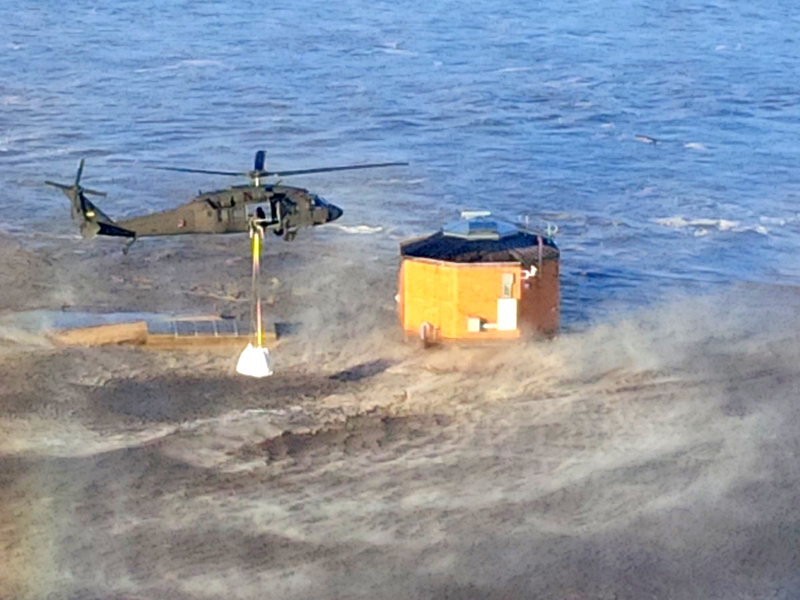 A Nebraska National Guard helicopter places sandbags near a city of Lincoln well in flood-ravaged area near the Platte River. Campus Recreation facilities are encouraging the use of bottled water and asking users to limit showers. Laundry services will also be limited across the campus to only what is essential. Campus greenhouses will reduce water usage as much as possible. With most classrooms not in use this week, temperatures will be lowered in vacant classrooms to reduce requirements for steam heat and chill water use. As an institution, the university will utilize the Thermal Energy Storage tanks to minimize city water input for cooling, and the tanks will be recharged overnight to prevent impact on peak water usage times. Preventative maintenance activities for facilities or transportation that require water have been postponed. Any critical maintenance or cleaning will occur overnight. "While we are fortunate that our City and East campuses have escaped the devastating flooding facing many areas of Nebraska, and that our other Extension and Agricultural Research facilities avoided major damage – we are committed to being a good partner to the City of Lincoln and the residents of Nebraska as our state deals with the impacts of this natural disaster," Green said. Questions, or suggestions for additional ways to conserve water, can be directed to the university's Office of Sustainability at sustainability@unl.edu. Learn more about how students, faculty and staff can help with the flood recovery process.